I sometimes struggle with the word luxury. One person’s interpretation of the word can can be totally different to another. So when I was told that my trip to Hong Kong would be to experience the city in total luxury, I was sceptical. 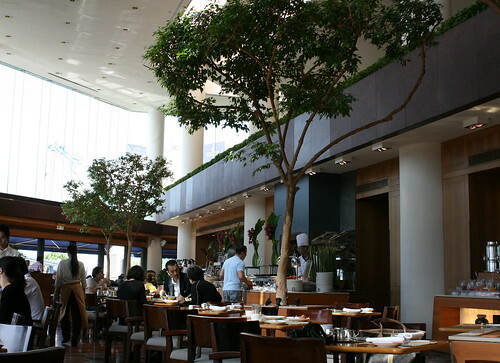 That is, until I arrived at The InterContinental – the chosen hotel for our four night stay. As soon as we stepped off the bus that delivered us to the hotel from the airport, we were greeted by bell boys dressed head to toe in crisp white suits who whisked our cases away and disappeared off into the distance. Normally I would have been frightened but I have watched Home Alone enough times to know that bell boys deliver your luggage to your room so you don’t have to lug it there yourself. ‘Miss Kemp, would you like to follow me please’. I looked to my right and saw a hostess, who was on hand to personally show me to my room. I followed her through the reception area to the lift. We stopped off on the tenth floor and I was shown to my room. As soon as the door opened, what was to become a very familiar scent flew up my nostrils and embedded itself in my memory. The whole hotel must have been sprayed with the same floral scent that I don’t think I’ll ever forget. Seconds after the door closed, there was a knock. It was the bell boy with my case. Feeling bad that I hadn’t yet changed my currency, I thanked him as he smiled and skipped back out of the door. Once alone, I turned around and had a chance to marvel at the view from the window, which spanned from floor to ceiling and wall to wall. 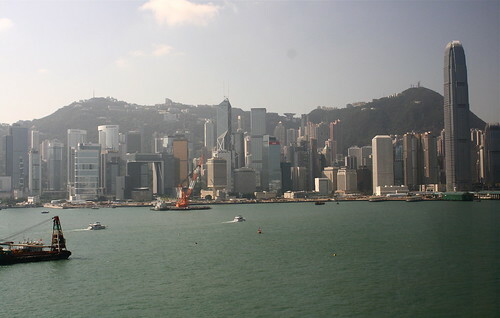 A perfect skyline stood in front of me as I looked out over Victoria Harbour and Hong Kong Island. 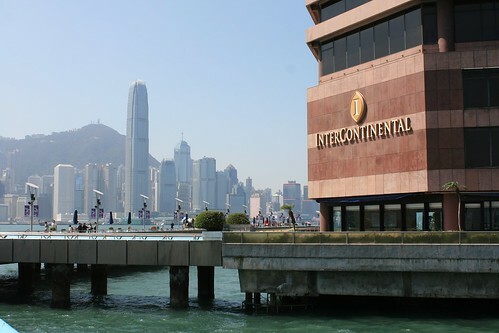 The InterContinental was built over the harbour’s edge in Kowloon and follows the principals of Feng Shui. Chinese legend states that the nine dragons of Kowloon come from the mountains each day to take their morning bath and drink from Victoria Harbour. The large water fountain that welcomes customers at the front of the hotel represents the Pearl of the Orient, which draws the nine dragons from the nearby mountains. As dragons can travel through glass (obviously! ), the Feng Shui master chose a large glass fronted entrance so that they can easily glide through the building and back out the other side to bathe and drink from the water. But first the dragons must stop off at the reception desk to drop off some of their wealth before proceeding through the lobby’s expansive windows. Around two thirds of the rooms at The InterContinental have the fantastic view overlooking Victoria Harbour and Hong Kong Island, while the remaining rooms overlook the pool area. I planned to go to the pool on my first morning but thought better when my alarm went off early, knowing what a busy day we had in store. I made it down the next day and didn’t realise just how luxurious it would be. 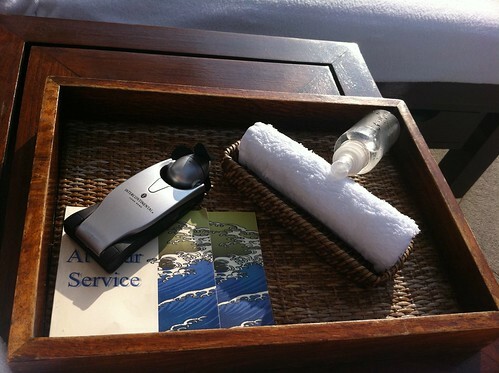 As soon as I walked through the door, I was greeted and asked for my room number and after lying down on a perfectly white cotton towel lined sunbed, the pool attendant walked over and greeted me by name before placing a tray down next to me, which contained a mini fan, flannel and a small bottle of water mist. I soaked up my beautiful and serene surroundings for a while before making use of the infinity spa pools, overlooking Victoria Harbour and Hong Kong island. My bedroom had an incredible amount of features and discreet services that only the really observant would see during our stay. A pillow menu, a complimentary tea card with a wide selection, the biggest bed I have ever seen (wider than it was long! ), a large sunken bath, Elemis toiletries, a desk, a 24 hour butler service a 37-inch LCD TV, docking system, mini bar, plate of fruit (changed daily) and what was to possibly become the biggest topic of conversation on the whole trip. Shortly after my host left me after check in, I spotted a model rickshaw, which was surrounded by Asian inspired cakes and biscuits. Having seen fake food many times before, particularly in Japanese restaurants in Soho, I assumed that the contents of the plate were there just for show. I prodded a couple of the cakes and although they felt soft, I decided to stay away. Big mistake. Another of our group revealed when we all met at reception that evening that she had been ‘picking at the rickshaw’ and had enjoyed EATING IT!!! By the time I got around to looking back at the plate, it had been changed. Each day when I arrived back at the hotel, I opened my door in anticipation of what culturally relevant edible masterpiece was waiting for me on the side board. 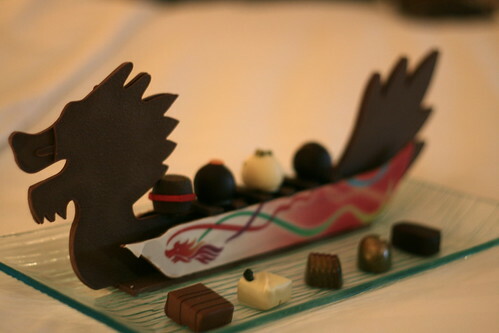 Each day the edible display was lovingly created by the in house pastry chef. I thoroughly enjoyed devouring my tram the next day, which was surrounded by crisp and gooey macaroons and the dragon that I had on the last day took the long trip back to the UK with me. I had to break it up but it arrived safely! Other hotel features include a fully equipped fitness center, which is open 24 hours daily, a spa, eleven harbour view function rooms, the largest ballroom in Hong Kong, a business centre, not to mention the in house restaurants. The InterContinental boasts a range of restaurants including NOBU, Spoon by Alain Ducasse, Yan Toh Heen, The Steak House and Harbourside. Each day we sat down to breakfast in the Harbourside restaurant and were able to choose from the biggest buffet I have ever laid my eyes on. 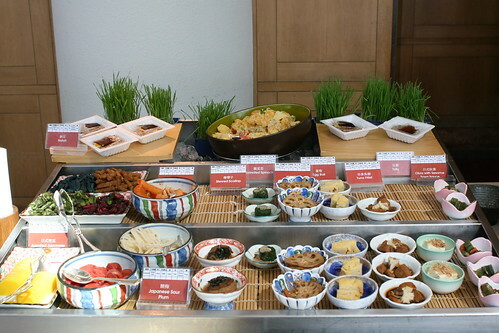 I am told that buffets are popular here and it seems the bigger, the better. I didn’t go a day without having at least two courses for breakfast – choosing waffles, pancakes, fresh fruit, a fry up, Dim Sum, smoothies, pizza (!!!) and fresh juices. All this whilst looking out over the sunny harbour. What heaven. On our last evening in Hong Kong, we were treated to one of the ‘Nine Dragon Cocktails’ in the Lobby Lounge. Created by international cocktail chef Ben Davidson from Australia, the cocktails signify each of the nine dragons and are aptly named. 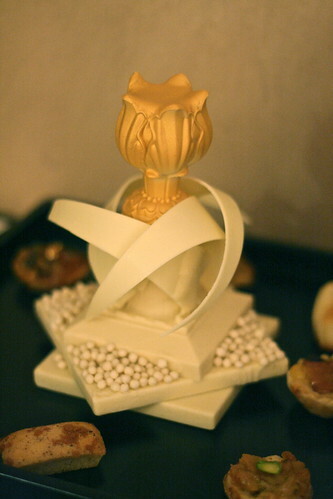 All flavours are balanced, which is reflective of the Chinese aspiration of balancing yin and yang. I opted for the Emperor Dragon – martell vdop, grand marnier, fresh mandarin juice, passion fruit and perrier Jouët grand brut (HK$215, around £17). 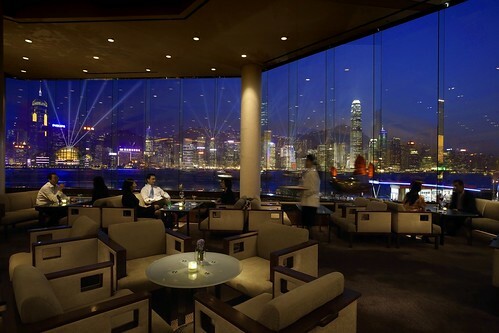 Each cocktail was presented on a light up coaster, which represented the glowing lights as you look out to Victoria Harbour at night time. During my four night stay at The Inter-Continental, I felt utterly calm, comfortable, happy, relaxed and dare I say it, healthy. Now, during my visit to Hong Kong, I cannot say that I was healthy – I probably ate and drank far too much but the serenity of the hotel got hold of me. Was it the talk of the Feng Shui, the constant attractive smells, the politeness of everyone that approached me, the efficient mannor in which business was conducted? It might have even been something in the water, I’ll never know. What I do know is that I will forevermore look back fondly at my time at The Inter-Continental.